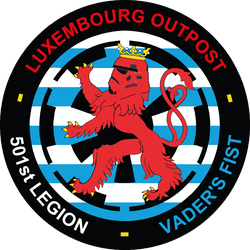 501st Legion - 501st Luxembourg Outpost! In 1997, the 501st Legion was founded by Albin Johnson, with the idea to bringh together the costumed fans of the Star Wars saga with other like-minded people. Thanks to the enthusiasm for the white armor of the stormtroopers, the little group of ardent fans grew up to a now over 10.000 members international organisation. To show his gratefulness, George Lucas (Lucasfilm) named the unit of clone troopers in the movie "Revenge of the Sith", which after the Order66 fighting alongside Darth Vader during the attack of the Jedi Temple, after the 501st Legion. Click the logo to access the official website of the 501st Legion.